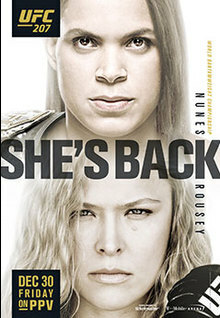 This is one of the most anticipated returns in UFC history, and fans have been waiting on this since her defeat. What does Ronda have left? She has talked retirement and no one knows her mindset going in. Will she be the Rousey who got upset or the Rousey who easily dominated? We will find out December 30. Nunes is a deserving champion, but at the peak of Ronda's fighting career she was more dominate then anyone in the history of the sport. The Co-Main features Dominick Cruz versus Cody Garbrandt for the bantamweight championship. Mainly this is intriguing and interesting because of all the trash talk. Dominick should open as a big favorite in this one. The main thing Garbrandt has going for him is one punch knockout power. The problem is he has to catch Cruz in order to hit him. Cruz has one of the best, if not the best, movement in MMA. The card lost some great fights a long the way, but with two title fights still on the card it's still going be fun to watch.